The host and guest talk about how to the Internet of Things to create efficiencies for your clients and save them money overall. They also discuss the pros and cons of building and partnering to solve IoT security issues. “There’s no ‘expert in the field’ that’s at any business because so few individuals at any business have really done this,” Schwartz said. An MSP with deployment experience can guide new clients through IoT solutions and help grow the products they provide. “Ultimately, we want people to do what they were trained to do and not get pulled away from their skill set by getting bogged down these random tasks that IoT really can supplement and take over for them,” Schwartz said. His company uses IoT to monitor corporate-provided mobile devices and identify cost-cutting methods, and creates reports for those enterprises so they can drill down and enforce a mobile policy. 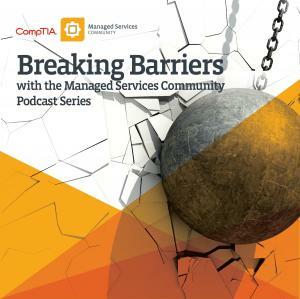 The Breaking Barriers podcast, from CompTIA’s Managed Services community, features experts in the MSP space and interviews with members of the CompTIA Managed Services community. You can download the white paper from the Managed Services Community resources at www.comptia.org/ and subscribe to this and all podcasts from CompTIA Communities on iTunes or wherever you get your podcasts.